Look for new installments of Mark Seinfelt's "Word Patriots" every Monday at WebTalkRado.Net. Life has been running away with me for several weeks, hence the scarcity of posts. 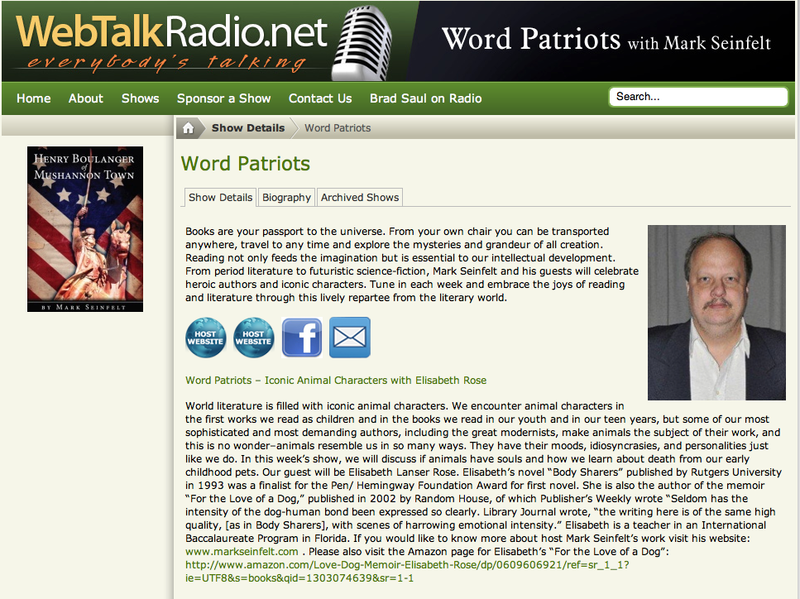 In between life’s demands, I’ve had the great pleasure of recording two appearances for Mark Seinfelt’s webcast “Word Patriots.” On next week’s show (July 4), I review Mark’s novel Baldr and Beatrice. On July 11, I explain how the work of William S. Burroughs has influenced my own efforts. More importantly, Mark’s prepared a number of great shows in the past several weeks featuring an impressive and compelling array of guests and topics. Good going, Mark! The following list reflects hours and hours of Mark’s (and Turk’s!) labor of love. To hear these programs, visit: http://webtalkradio.net/shows/word-patriots/. Part one of a two-part interview—will be the first of a series of periodic shows devoted to past masters, heroic word patriots who overcame great obstacles, who wrote in new and innovative ways, or who defied convention by visiting formerly taboo topics and thereby opened new fields of exploration for literature. In the second part of Mark’s interview with his father, Dr. Frederick William Seinfelt, the author of the 1975 book George Moore: Ireland’s Unconventional Realist, and two companion essays, “Wagnerian Elements in the Writings of George Moore” and “Thomas Mann and some American and British Writers,” Mark and his father continue their discussion on Richard Wagner and his influence on world literature, this week focusing primarily on the novels of the German Nobel Prize-winning author Thomas Mann. On April 30, Mark and his recording technician, Turk, attended the second annual “Meet the Authors of Indiana County, Pennsylvania, and Beyond” book expo at Windgate Vineyards and Winery in Smicksburg, Pa.
Bruce Trinkley is the composer of incidental music, songs and choruses for over twenty theatre and dance productions. He has also written extensively for choral ensembles. A poet and instructor of English, Jason Charnesky has written the lyrics and librettos for many works by Trinkley, including a trilogy of one-act comic operas: EVE’S ODDS, GOLDEN APPLE, and CLEO. A full-length opera, YORK: THE VOICE OF FREEDOM was filmed by PBS station WPSX. SANTA ROSALIA, a cantata based on a painting by Fernando Botero, was performed in Bogotá, Colombia in 2007. This program is full of lively debate and personal reminiscence as Bruce and Jason discuss their concept of lyrical theatre, following in the tradition of other works that are through-composed, like opera, so that every word is sung, and so that there is a dramatic thrust and pacing to the entire piece; the roles of artist and audience; collaborative artistic endeavor; and, first and foremost, how words and music, composer and librettist, work together. Dimitri Anastasopoulos is the author of the 2001 novel “A Larger Sense of Harvey” published by Mammoth Books, which concerns a team of linguistic scholars, their friendships and hatreds, and the tensions which sabotaged their “langoo-adj” research project, a groundbreaking attempt to break down Indo European language barriers. He is currently at work on two novels-in-progress, the science fiction extravaganza “Farm for Mutes” and “New Crimes of the Terrorist,” a historical novel set in the Balkans in both the post World War Two period and in the tumultuous, bloody 1990s. Christina Milletti is the author of the 2006 short story collection “The Religious & Other Fictions” published by Carnegie Mellon University Press. Her stories have appeared in the Chicago Review, Harcourt’s Best New American Voices, Pennsylvania English, and the Alaska Quarterly Review. There are many Christina Millettis. She is an author, mother, wife, and an Associate Professor of English at the University of Buffalo in New York. One or several of these multiple Christinas is the author of the wonderful debut collection “The Religious & Other Fictions” published in 2006 in the Carnegie Mellon University Press series in short fiction. Christina and IMark discuss the difficulties contemporary women have juggling their many identities and her relationship with her husband, last-week’s guest, novelist Dimitri Anastasopoulos and what it is like when two authors share one household. Robert C.S. Downs has published six novels, one collection of short stories, and written one television film. His novel “Going Gently,” published by Bobbs-Merrill in this country and Faber and Faber in Great Britain, was produced for television by the BBC. It starred Norman Wisdom and Judi Dench. The production won five British Academy Awards and was voted best television film of its year. His novel “Peoples,” also Bobbs-Merrill, was produced as a World Premier Movie by NBC-Television, “Billy: Portrait of a Street Kid,” that starred LeVar Burton, a drama about a ghetto youth’s efforts to escape his dismal existence and his chance at a future as a veterinarian’s assistant. Recording technician Donnie “Turk” Schnars ousts Mark from his interviewer’s chair to discuss his first two books “Final Drafts: suicides of world-famous authors” and “Henry Boulanger of Mushannon Town: A Novel of the American Revolution” with two of my previous guests, novelist and memoirist Elisabeth Lanser Rose, author of “Body Sharers” and “For the Love of a Dog,” and poet Jason Charnesky, who has penned the lyrics and librettos for many works by the composer Bruce Trinkley, including a trilogy of one-act comic operas: EVE’S ODDS, GOLDEN APPLE, and CLEO, a full-length opera, YORK: THE VOICE OF FREEDOM and SANTA ROSALIA, a cantata based on a painting by Fernando Botero.